1.Little leather smell is normal. Putting it in well-ventilated areas for few days, the smell will disappear soon. ❤ 100% VEGAN LEATHER-HIGH QUALITY -- Totally Eco-friendly and Safty Material, 100% artifical without hurting animals, We still ensure the durability and long term use of this handbag. It is fashionable European & America style. ❤ CLASSIC AND CONVERTIBLE -- Classic Style All-Seasonal Solid Color with Monogram Logo. The wallet matching with Removable Wrist Strap & Shoulder Strap. This wallet is definitely brand name feeling and extremely classic style. Wallet by Macro M. Kelly collection.Our goal is to ensure that you're 100% satisfied with your purchase right out of the box. 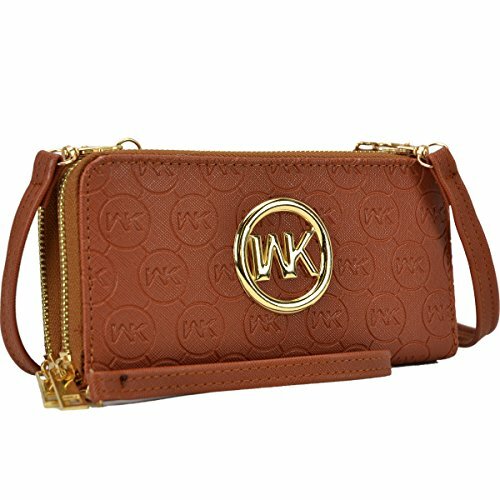 ❤ ROOMY STORAGE FOR ALL -- Approx Size: 7.5"W x 4"H x 1.75"D + Removable Wrist & Shoulder Strap [Make you convenient when putting the wallet on your wrist] Which means this Trendy Wallet is big enough to carry most of your daily belongings like All Plus Size Iphone, Credit Cards and Personal ID. ❤ 100% MONEY BACK GUARANTEE--If you're not 100% happy with your purchase within 60 days, let us know, we'll refund your entire purchase price. If you have any questions about this product by 1988 Marco M.Kelly, contact us by completing and submitting the form below. If you are looking for a specif part number, please include it with your message.